The EDM Zap Advantage EDM Power Supply is loaded with features that allow you to be more profitable and productive. The Manual version offers operators a familiar control panel while the advanced electronics on the inside work to be productive every step of the way. 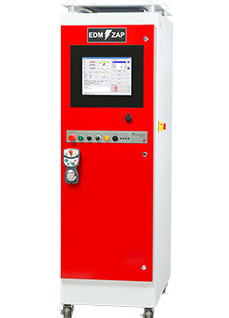 The ZNC and CNC versions feature powerful programming capabilities allow operators to conduct quick burns or customize a series of functions. The advanced materials give users instant access to 100’s of different material combinations with burn settings so you can get started right away. The main screen gives instant feedback so you know the job is running smoothly. The Advantage Power Supply is assembled and supported in the USA by EDM Zap, one of the oldest EDM organizations around. EDM Zap has been servicing and supporting EDM equipment since 1971. Traditional stand alone design with state of the art electronics. 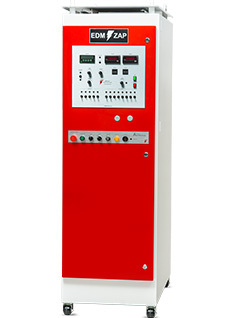 Designed to be a plug and play replacement for the many power supplies manufactured with the machine tool connection standards established by Elox and used by many manufacturers throughout the years. The Advantage ZNC is built to give users reliability and depth programmability. Designed for easy operation the EDM Zap Advantage sets a new standard for EDM power supplies. The Advantage CNC takes EDM to the next level with performance and programming capabilities with advanced orbiting capability including X Z and Y Z orbiting routines. The EDM Zap Advantage E-Series is the only EDM power supply on the market that was specifically designed for the energy industry. Nuclear, Coal, Gas, and Wind can benefit from its compact design and exceptional performance. Can also be used in other industries. EDM Zap has been servicing and supporting equipment for nearly 50 years. EDM Zap can design and build custom EDM equipment for special applications. 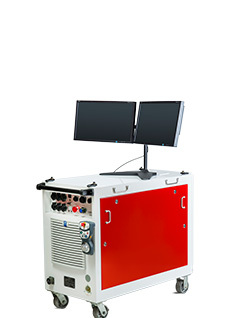 EDM Zap can install and provide training. Equipment is designed in-house and built either in-house or locally sourced providers. In addition, many of the components are made in the USA. EDM Zap offers a variety of options to extend the performance of your EDM equipment. Since EDM Zap manufactures the equipment, we can also provide custom modifications for your applications to get the most out of your equipment.